Unfortunately there was no return-to-sender on the back of the envelope. There is no date stamps either but my research tells me that first class American postage stamps cost 29 cents between the years 1991-1995. This bookmark fascinates me. 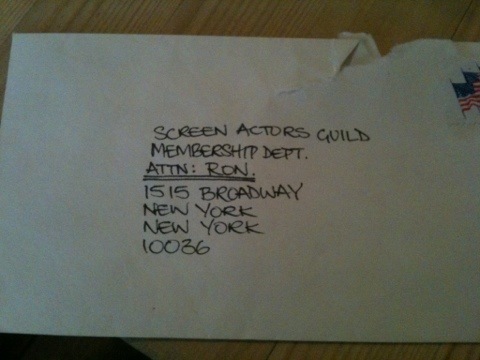 The lack of postmark suggests either the aspiring actor/actress decided not to apply for membership of the Screen Actors Guild or either (the one I hope is true!) that the postal service delivered the letter without franking it. Just who was that actor/actress? What is he/she doing now? Sometimes a bookmark can tell just as much of a story as the used-book you find it in.